So the court has issued a judgment against you on a debt. You may be wondering if there is anything you can do now, or is that game over. Fortunately, you may have options available to you in dealing with the judgment that will keep you from handing your hard-earned money over. Whether you first learned of the Judgment from a wage garnishment or from your credit report, it is not too late to contact us. Removal from your credit report. With more than 20 years of legal experience, our St. Louis-based firm strives to provide detailed guidance to clients in St. Louis Missouri and the surrounding areas . Our lawyers and staff offer the detailed advice you need to understand your various options. Contact us to schedule a free consultation to discuss your specific concerns and learn how we can be of assistance. The attorneys at The Law Office of Kenneth P. Carp, PC, know the rules regarding the collection of judgments, credit reporting agencies, and credit reports. Your creditors have aggressive attorneys so let Kenneth Carp be aggressive for you. 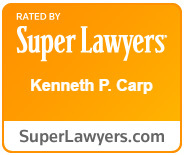 Put over twenty years of court experience with our senior attorney Kenneth Carp, a retired Lt. Colonel with the US Air Force, has the right experience to represent you. Call (636) 947-3600 to schedule an appointment.